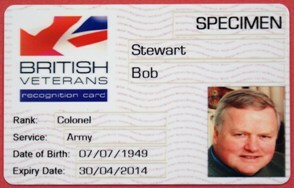 Subscription to The British Veterans Recognition Card is an annually renewable membership offering a number of benefits. Subscribing to The British Veterans Recognition Card costs £32.50 for the first year (£15 joining fee and £17.50 annual subscription). To continue membership for the second and subsequent years costs the annual subscription fee of £17.50. For those over the age of 65 years, who wish to belong to the scheme, we will waive half the initial joining fee of £15. There are no hidden costs to membership. The Joining Fee covers the administration involved in first producing your card and all the overheads incurred in entering into contracts with our partners. Your subscription fee covers access to the website, regular newsletters and correspondence, together with the reissue of your card in subsequent years. We negotiate deals with our partners and pass the entire discount on to you, unlike other schemes where an element of the discount is retained by the management organisation. Call our Customer Services Department on 01425 656843 to request an application form. Print out the online application form and submit, together with supporting documents. The card is a Recognition Card and not a pass or permit to any military or MOD establishment. Because we are always endeavouring to improve the offers from our existing partners and to seek new partners, the discounts listed are subject to change and every effort will be made to notify members of the current situation through the website and our newsletter.